And lards the lean earth as he walks along. Were’t not for laughing, I should pity him. – Shakespeare, Henry IV, Part I, 2.2. The French have always been a bit sniffy about William Shakespeare. Voltaire, for example, complained that his “monstrous Farces… had not so much as a single Spark of good Taste, or knew one rule of the Drama” (1). In other words, Shakespeare’s plays, with their mongrel meshing of genres, exuberance of language and extremities of action, offended perceived standards of classical theatrical form. If this is true, then Shakespeare’s most beloved creation, Sir John Falstaff, may be the playwright’s most representative character, a figure willfully “out of all compass” (2), a man who scorns the restraints of good taste by indulging his appetite, for food, fellowship and females. Falstaff began life as a secondary character in Henry IV, Part I, a seedy gentleman-thief-braggart-glutton-drunkard-liar, who served various dramatic purposes: as a reconstituted figure of Vice from medieval morality plays (3); as one of the two father-figures Prince Hal, the play’s hero, must reject as he accedes to the kingship; as a deflating or choric counterpoint to the chivalric rhetoric of Hotspur and the Machiavellian scheming of the King. But, as he developed, Falstaff began to dominate the plays, to such an extant that Queen Elizabeth is said to have demanded Shakespeare continue his adventures, resulting in The Merry Wives of Windsor. In the 17th century, the comedy of Falstaff and the Eastcheap world of taverns, whores, thievery and dung was extracted from its original context and regurgitated in self-standing entertainments such as The Bouncing Knight, or, The Robbers Robbed and The Boaster: or, Bully-Huff Catched in a Trap (4). Orson Welles’ rearrangement of the plays is nothing new. Indeed, it was nothing new for Welles himself; in 1939, his vast theatrical folly Five Kings combined a series of Shakespearean history plays, using Falstaff as its pivot. Welles makes radical changes to the Henry IV plays, unifying the pair into a single narrative, editing or switching the order and content of whole sequences, importing scenes and speeches from other plays (Richard II, The Merry Wives of Windsor and Henry V), framing his narrative with extracts from Raphael Holinshed’s Chronicles of England, Scotland and Ireland (Shakespeare’s source for the history plays) and using T.H. White’s The Once and Future King (1958) as guiding subtext (5). Welles’ idea was to contrast the Arthurian/chivalric worlds of Falstaff and Hotspur (the fiery warrior whose rebellion against the King comprises the plot’s first half) with the emerging modernity represented by the King and Hal. This hybrid was first performed as a play in Belfast in 1960 (6), and was further crossbred by the conditions of its film production. The spring of Merrie England was shot in the winter of Franco’s Spain; scheduling difficulties led to mismatches of location and weather (7); some of the huge international cast (which included such luminaries as Margaret Rutherford, Fernando Rey, Marina Vlady and Jeanne Moreau) were dubbed, while other speeches were erratically synchronised. Yet this mish-mash, so characteristic of Welles’ post-Hollywood films, strangely mirrors the condition of Shakespeare’s text, which itself exists in an unstable state. Like all of Shakespeare’s plays, there is no “original”, “author-ised” version of Henry IV. What survives are increasingly corrupt reprintings derived from unknown sources, perhaps Shakespeare’s original manuscripts and drafts, or prompt-books and actors’ parts used in performance. The earliest surviving complete edition of Part I (published in 1598) differs substantially from the “canonical” version published in the First Folio of 1623, differences exacerbated by emendations made as a result of political censorship and changing public taste in the intervening period (8). This very uncertainty and instability is used by Welles in his rewrite to thematic advantage, as his anti-hero manoeuvres a slippery narrative world he fails or determines not to comprehend: the film’s first image sees Falstaff as a tiny silhouette, picking his way through a snowy, leafless landscape. Shakespeare’s Henry IV plays are highly patterned, each part repeating and reflecting the other. Welles reimagines this as a kind of loop, with actions starting, finishing, and beginning again, with decreasing vigour. The film is divided by the harrowing, ten-minute Battle of Shrewsbury, a squabble of fog and mud in spliced cuts, fast- and slow-motion and hand-held camerawork, set to the din of horses’ hooves, soldiers’ roars and groans, the clank and whoosh of armour and weapons, and music veering from stirring military to anguished, wordless choir, to percussive doom, as all the while Falstaff (Welles)’s squat, helmeted figure scurries away from danger like a medieval R2-D2. The film’s first half contrasts the chilly displays of power in the King (John Gielgud)’s castle (compared by James Naremore to the Thatcher Memorial Library in Citizen Kane, 1941 (9)) and the reckless rhetoric of Hotspur (Norman Rodway), to the giddy, seemingly carefree world of Falstaff, with Hal (Keith Baxter) uneasily navigating the three, his laughter and playfulness in the latter turned rigid by the duties and demands of the first two. These clashes give the first half a buoyancy best demonstrated by the Gadshill robbery sequence, as grown men mess about in the woods, their larks seeming to make the very trees move. All this zest appears to expend itself with Shrewsbury. After the battle, the film attempts to begin again, with Ralph Richardson narrating from Holinshed, the King speechifying in his castle, and Hal and Poins (Tony Beckley) plotting a jest on Falstaff, but the energy flags; inertia and decay dominate. This second half comprises seven sequences: the King dying; Hal, “exceeding weary”; Falstaff “melancholy” and “old”, forced by impoverishment and flagging energies to disband his followers, unable to arouse himself even for his mistress (Moreau); the King dies, intercut with Falstaff and Justice Shallow (Alan Webb) reminiscing about death and absent friends, bringing the film back full (vicious) circle to the opening flashforward; Hal banishes Falstaff, who dies off-screen; and Falstaff’s massive coffin is wheeled off into the kind of barren landscape from which he entered. This decline is briefly halted by Hal’s coronation, the promise of which defibrillates Falstaff, the plot and film. This false hope is visualised in the film’s most extraordinary, yet commonly unregarded, sequence, the sort of “theatrical”, deep-focus long take Welles perfected in Citizen Kane and The Magnificent Ambersons (1942), and that was celebrated by André Bazin. Naremore vividly describes the shot (10); it begins with Falstaff at the back of the long shot, despondent, muttering and inert, and ends with him having marched across the shot’s entire field, reborn and looming over a camera that has to bend to take him in. This rising of hopes only serves to make the film’s climax all the more devastating. I’ve made the film sound rather sombre, and Welles himself said that in emphasising the tragic aspects of Falstaff’s story he lost much of the comedy (11). It has its detractors (12), but for connoisseurs, Chimes at Midnight is the Welles masterpiece (13) and the greatest of Shakespearean films. Welles works visual wonders out his small budget (between $0.8 and $1.1 million), the famously papier-mâché sets of his Macbeth (1948) giving way to the monumental castles and churches of medieval Spain, a solid grounding of “real world” against which the characters can believably live (14). Francesco Lavagnino’s extraordinary score, ranging from martial jaunt to the exhausted accompaniment to the King’s famous “sleep” soliloquy, performs far better commentary on text, character and staging than any scholarly apparatus. In spite of professed difficulties, the film features some genuinely full, Shakespearean performances, anchored by the central trio of Gielgud, Baxter and Welles. The latter’s performance has been criticised as “portentous and hollow” (15); in fact, Welles expertly belies Falstaff’s bravado and cheer by registering incomprehension, fear and sadness unspoken on his face. The finale is heartbreaking, but prepared for throughout. 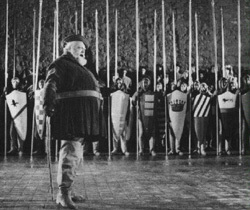 His may be a sentimentalised Falstaff – we get little of the war profiteer who gladly sends human wrecks to their death, or stabs the dead Hotspur “in the thigh” to reap honours attending on the killing – but it is Welles’ finest, most nuanced performance since Charles Foster Kane. The French partly atoned for past imbecilities by awarding this haunting film a special prize at Cannes. Voltaire, Letters Concerning the English Nation, Oxford University Press, Oxford and New York, 1999, p. 87. William Shakespeare, The Shakespeare Folios: Henry IV, Part I, Nick Hern, London, 2004, p. 122. P. H. Davison, “Commentary”, William Shakespeare, The First Part of King Henry the Fourth, Penguin, London, 1968, pp. 192-193. P. H. Davison, “Introduction”, William Shakespeare, The First Part of King Henry the Fourth, p. 9. Peter Conrad, Orson Welles: The Stories of His Life, Faber and Faber, London, 2003, p. 327. See the programme, Chimes at Midnight, Being the Adventures of the Fat Knight and the Prince of Wales from the Historical Plays of William Shakespeare, Commencing February 29th, 1960, held at Dublin City Library and Archive. Although this could be a visualisation of a “Disturbance in the state” being “reflected in unusual events in nature”. Peter Davison, “Commentary”, William Shakespeare, Henry IV, Part II, new ed., Penguin, London, 2005, p. 222. For more on the play’s textual history, see Nick de Somogyi, “Introduction”, William Shakespeare, Henry IV, Part one, xxvii-xxxix. James Naremore, The Magic World of Orson Welles, Oxford University Press, New York, 1978, p. 265. Quoted in Jack J. Jorgans, Shakespeare on Film, Indiana University Press, Bloomington, 1977, p. 109. See David Thomson, Rosebud: The Story of Orson Welles, Abacus, London, 1997, pp. 376-384. Joseph McBride, “Welles’s Chimes at Midnight”, Film Quarterly vol. 23, no.1, Fall 1969-70, p. 14. Although Peter Davison argues that an emphasis on “realism… works against the understanding of Elizabethan drama”. Davison, “Commentary”, William Shakespeare, Henry IV, Part II, p. 148.